The way we sanitize pools has become, in a word, sophisticated. With so many chemical solutions and sanitation systems on the market, it’s becoming increasingly difficult to gauge which methods are gaining traction and which are slouching toward obscurity. PSN conducted a wide-ranging survey to determine which among the myriad hardware products — salt chlorine generators, ultraviolet systems, ozone, advanced oxidation processes (AOP) — were gaining steam. We also wanted to learn how dealers navigate an increasingly complex market, not only competing against the internet, but also other dealers setting up shop down the street. The results bring clarity to a somewhat chaotic field — further muddied by an abundance of sales channels and shifting consumer attitudes — so you can operate your business more profitably. The days when chemical brands guaranteed dealers an exclusive sales territory have, by and large, gone the way of the phone booth. View All 6 Photos > These charts illustrate what’s trending in chemical and sanitation systems. Results came from an online survey of pool and spa industry professionals, representing builders, retailers and service technicians, throughout the U.S. and Canada. That’s still a source of frustration among 45% of respondents, who would like to be the only dealer on the block. E-commerce competition represents another sore spot. Nearly 60% would like more support from manufacturers in curbing online sales at lower prices. The encroachment of internet competition has become so fierce that 30% of respondents say that providing exclusive, in-store products was the No. 1 factor that would determine their loyalty to a brand. This far surpassed an exclusive dealership territory and dealer rewards programs. Despite these obstacles, the majority of dealers — nearly 75% — say they stand by their brands. Debbi Leclerc is one of them. She’s been committed to her supplier for more than 20 years. “There’s a family culture that’s very comfortable to work with, even though you’re dealing with a corporation,” says Leclerc, co-owner of the Pool Doctor of Rhode Island, in Coventry, R.I.
For her part, Leclerc isn’t as concerned about internet pricing and dealers encroaching on her turf. She commends her supplier for enforcing minimum advertised prices online, and says the vendor is cautious not to create competition too geographically close to her business. The perception that consumers care about nothing but cost is challenged by this statistic: Respondents say that nearly 60% of customers buy products that have earned their trust. 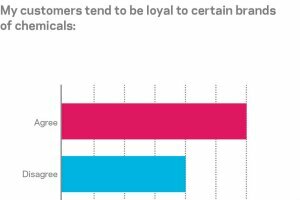 That means customers are nearly as loyal to chemical brands as the dealers who sell them. This points out something of a paradox: Helping foster this loyalty among consumers, ironically, is the very thing that keeps retailers up at night — the internet and big-box operations that offer lower-grade products at bargain-basement prices. That’s been Ralph Hartsing’s experience. The store manager at B&L Pool Supplies in Phoenix says customers often come to him for advice after being burned by low-cost, low-quality products. He’ll gladly put his copper-based algaecide up against any similar product sold by a competing department store. His preferred brand contains 7% copper and sells for $19.99. Compare that to the generic brand, which contains only 2%. Though Brand X is cheaper, the customer isn’t saving any money at the end of the day. “You’d have to spend $46.62 on their product to equal what we have,” Hartsing says. Customers also complain about cheap chlorine tablets that leave film of scum on their waterlines — the result of sub-quality tablets that use animal fat instead of borax as a binding agent. It’s a not-too rare occurrence that has homeowners running to their nearest pool store for professional advice. Hartsing is happy to turn them on to a superior product that only his store can sell. There’s something to be said of the dizzying number of water-treatment products on the market. As far as dealers are concerned, the more the merrier, so long as they work. According to the survey, most of these products — stain removers, conditioners, scale control, enzymes, etc. — perform as advertised, which helps solve perplexing pool problems and adds to dealers’ bottom lines. Nearly 86% of respondents say sales in this category are up. Algaecides, water conditioners and stain removers particularly fared well, with 85%, 84% and 75% or respondents, respectively, saying they sell or use these products. In the ever-expanding category of secondary sanitation systems, it seems there is only one that has truly become mainstream. No surprise here: Salt chlorine generators lead the pack among UV, ozone and AOP. Sixty-four percent of respondents say sales of salt-gen systems have increased over the past three years. According to the survey, three top reasons explain this upward trend: Customers request them; dealers urge homeowners to buy them; and many builders include them as part of their new-pool packages. However, the technology has its detractors. Almost 19% of respondents discourage consumers from purchasing the product. Hartsing sells quite a few of the units, but acknowledges that salt isn’t for everyone. He equates investing in a salt-chlorine generator to belonging to a golf or tennis club: It’s only something you’d do if you plan to participate in that activity every day. “If you’re not swimming a lot, you’re not going to get the enjoyment out of it to make it worth the investment,” he says. Plus, there is the added cost of replacing the salt cells, which is a deal breaker for some. As more and more salt-gen systems are installed, other methodologies are losing market share. Most respondents say sales for in- and off-line chlorination systems are down. Likewise, more than half the respondents say that sales of UV, ozone and AOP systems for residential pools have decreased over the past three years. Some chalk this up to cost, saying the units are still too pricey for many homeowners. Others say the technology is overkill for small backyard pools, as the units were initially designed for commercial pools to meet strict health codes and kill bacteria amid high bather loads. From where Bill Kent stands, salt-gen has come to dominate the market so much that other secondary sanitation systems do not stand much of a chance. The CEO of Team Horner, a Fort Lauderdale, Fla.-based pool supply distributor, hasn’t seen the UV, ozone or AOP technologies make inroads into the residential market. That isn’t to say these systems have no buyers. Results came from an online survey of pool and spa industry professionals, representing builders, retailers and service technicians, throughout the U.S. and Canada.